As the search for new ore deposits moves ever deeper, both major and junior mining companies are increasingly using MT and AMT for both brownfields and greenfields exploration. 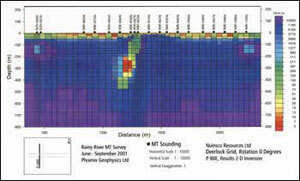 INCO's 1991 proof-of-concept study in Sudbury, Ontario started this trend with two AMT sites that sensed a 1750 meter-deep nickel deposit. Falconbridge followed with a feasibility study in 1996 that accurately located two Ni-Cu mineralized zones at ~800 m and ~1350 m.
Since then, Falconbridge has acquired over 2000 MT/AMT sites in the Sudbury basin and elsewhere. In 1999, INCO acquired ~1500 MT/AMT sites at the Voisey's Bay nickel deposit discovered in 1996. Today, thousands of MT/AMT sites are measured every year by worldwide companies, demonstrating the value that industry players place on these techniques. Tomorrow's mineral discoveries will likely come from depths greater than known ore bodies and may be covered by thick layers of overburden. Finding these deposits requires more sophisticated technology than traditional prospecting methods. Phoenix MT/AMT technology answers that need. 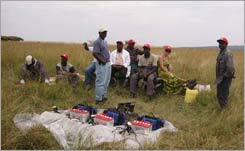 MT/AMT is a proven supplement or alternative to expensive traditional approaches like diamond drilling and borehole geophysics and less-costly but shallow-penetrating airborne EM techniques. Mining MT/AMT is used around the world, including locations in Canada, the USA, Mexico, Chile, Bolivia, Peru, Argentina, Australia, Papua New Guinea, China, Russia, Uzbekistan, and Japan. Plan maps of apparent resisitivity and phase highlight conductive bodies at specific depths (click picture to enlarge it). is by far the best…for detecting deep targets." angle of this conductor (click picture to enlarge it).